As a college kid, I celebrated the end of exams by binge-watching James Bond movies, with a select group of equally passionate friends and a gluttonous order of Chinese takeout. The evening always ended with a debate I’ll call Best Bond Ever: which actor defined 007 in the movies? We’d come to blows over Sean Connery and Pierce Brosnan (this predated Daniel Craig), snicker at the lipstick on George Lazenby’s kilted thigh, and agree that Roger Moore is the one we should be licensed to kill. It took a protracted dive into the Ian Fleming canon, however, for me to appreciate his true genius. Never mind his heroes; Fleming stands or falls by his villains, a group of the creepiest people ever to walk through a writer’s psyche. The creator of 007 is alleged to have been a sadomasochist, something attributed to the canings and bullying he suffered at Eton, and his villains relish torturing Bond far more than killing him. Of significance, however, is that the viciousness of Bond’s rivals makes his violence intensely personal. Revenge, in Fleming’s world, is always justifiable, and it elevates his crusades far above a mere license to kill. Herewith, the Top Ten Bond Villains According to Mathews. The majority are straight from the pages of Fleming’s novels, but I’ve thrown in a few Hollywood actually wrote. He’s a character who recurs in a trilogy of novels—Thunderball, On Her Majesty’s Secret Service, and You Only Live Twice—and he’s the genius behind SPECTRE, the world criminal syndicate. As an adversary he’s curiously ascetic, however, and most of his violence is committed by minions. Blofeld prefers to stroke his cat in a chilling atmosphere of detachment, but his chief claim to a spot on this list is the single act that nearly destroys James Bond’s sanity and life: the murder of wife, Tracy, in his arms, on their wedding day. Those who only know the story of Live and Let Die from the Roger Moore film owe it to themselves to read Fleming’s original novel. Felix Leiter—American CIA agent and Bond friend who first appears in Casino Royale—teams up with 007 to catch a Jamaican smuggler named Mr. Big, who is working for the Russians. One of the most horrific scenes ever written recounts Bond waking up to the delivery of a bloody package on his doorstep: the living of Felix, who has been deliberately fed to a great white shark. As the eponymous villain of Dr. No, our Julius is physically icky—he lost his hands in a chemical vat while conducting nefarious experiments and has replaced them with steel pincers—but they’re nothing compared to his twisted little brain. He prides himself on the creation of an obstacle course that tests the limits of human agony. And yes, Bond is the lab rat. 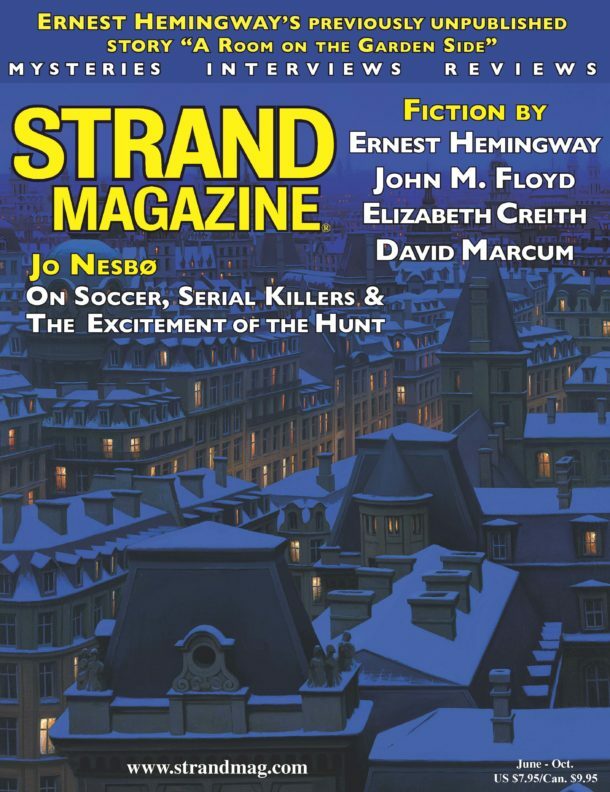 As early as 1953 and the publication of Fleming’s debut novel, Casino Royale, the writer was pushing the envelope of reader squeamishness with a scene in which Le Chiffre—a French traitor working for the Russians—ties Bond to a chair devoid of its cane seat and viciously whacks his naked scrotum with a tennis racquet. Bond’s metaphoric and literal emasculation is patiently and mind-numbingly described. Blood drips and pools on the floor beneath the chair with the excruciating slowness of Chinese water torture. Death is too swift and easy for Le Chiffre. 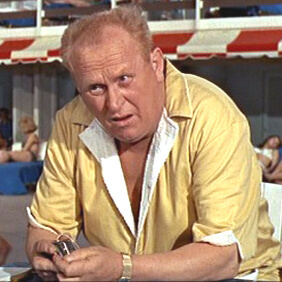 It’s impossible to glance at photographic stills from the movie version of Goldfinger and not see Donald Trump in the form and features of Gert Fröbe, the actor who played Auric Goldfinger. But let’s get back to the book: Goldfinger is a card cheat and gold hoarder who finances the Soviet spy ring known as SMERSH. He plans to steal Fort Knox’s gold reserves by blowing its vaults open with an atom bomb. Along the way, Goldfinger paints the entire body of his mistress, Jill Masterson, with gold paint—suffocating her—and has his Korean strongman, Oddjob, torture Bond. This pleasant sojourn culminates in Bond being placed beneath a circular saw designed to cut him in two, a device that was upgraded to a laser aimed at Bond’s crotch in the Sean Connery movie. Pierce Brosnan made his debut as James Bond in the film GoldenEye, which Fleming never wrote. It’s remarkable for the more personal revenge plots in the Bond canon, and one of the most complex villains Bond faces—Alec Trevelyan, better known as 006. Trevelyan is played by Sean Bean, who famously auditioned for the role of Bond before it was awarded to Brosnan, and the doppelganger effect of the two perfect British agents, once brothers in arms and now sworn enemies linked by bitterness and betrayal, makes Trevelyan an antihero for the ages. He wants to see Bond suffer so he can feel whole again, and the torture, in this case, is psychological. From Russia With Love is the Bond book John F. Kennedy admired most; it was a runaway bestseller, and with reason. Soviet spymistress and SMERSH villain Rosa Klebb is one reason why. Famous for a poisoned knife blade concealed in the toe of her sensible black shoes, she never met a man she wouldn’t double-cross or kill, no matter whose side he’s working on. Another creature created by Hollywood, Elektra King is the only true female Bond villain—most of Fleming’s evil women are sidekicks, not the main story. As played by Sophie Marceau in the 1999 film The World Is Not Enough, Elektra is different. Kidnapped by the terrorist Renard from her industrialist father, she sets about seducing her captor, mind and body, then deploys Renard to murder Daddy. Bond is dispatched to rescue a woman he believes is suffering from Stockholm syndrome—but, in fact, Elektra entraps, tortures, and seduces Bond while he’s strapped to a garotte. The scene in which she taunts him as he indecisively levels the gun and shoots her in the head is one of the most conflicted in the 007 filmography. Another killer who animates Fleming’s From Russia With Love, Red Grant is the capitalist foil to Rosa Klubb’s Stalinist dyke: a coldblooded hired hitman who fulfills his contracts with ruthless persistence. Fleming once described his inspiration for the Bond character as “a blunt instrument,” but he realized that ideal most fully in Grant—who has no honor, no remorse, no emotion, and no ability to exist without violence. He is the distorted mirror image of Bond himself. Our last and creepiest Bond villain is not found in any of Fleming’s books but, as realized by Javier Bardem, is too compelling to ignore. Raoul Silva haunts and terrorizes Skyfall, the third Bond film to feature Daniel Craig as 007, and his psychopathic turn as the killer created by Her Majesty’s Secret Service, and the venerable M herself, is unforgettable. He manages to get inside even Bond’s head, challenging everything he believes—and everything he has nearly died for. Shaking the faith of the most unshakable spy in history is the most unforgivable of all villainies. Felix Leiter was never an FBI agent. He was a CIA officer and after his severe maiming in Live and Let Die he worked for Pinkerton’s, an American private detective agency. (Note that CIA employees call themselves “officers” and never “agents” as agents are those recruited by CIA and SIS officers.